Unveiled at the Dubai show this week, the Calidus B-250 is a light attack/trainer aircraft that has been developed in Brazil but which will be built in the UAE by Calidus (Chalet A34-35) as part of the Bader program. A facility is being completed in Al Ain to build the aircraft, which is intended for a range of duties, including ISR, counter-insurgency, close air support and training. The avionics are provided by Rockwell Collins in the form of the touchscreen Pro Line Fusion system, which supports a digital head-up display. Calidus is performing the missionization of the system and will handle further updates, drawing on Fusion’s open systems architecture. For the ISR/light attack mission the B-250 is fitted with an electro-optic turret and can carry a range of weapons on its seven hardpoints. 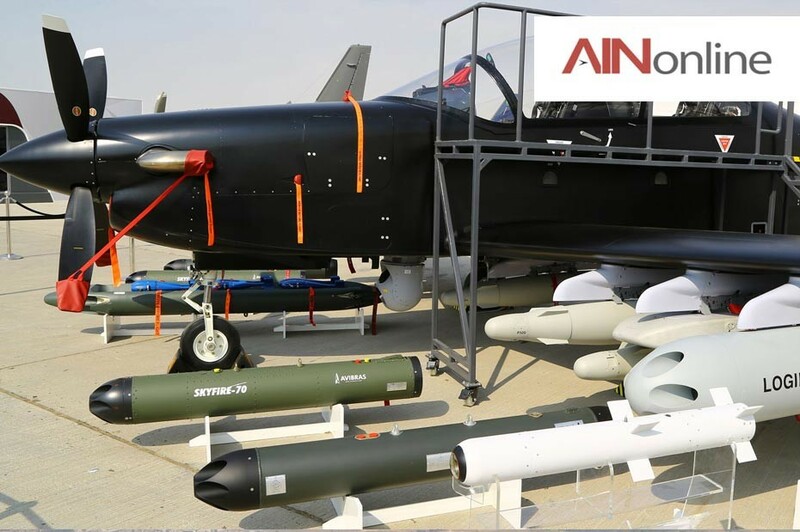 The example in the static display is being shown with GPS-guided bombs from Tawazun Dynamics, the LIG Nex1 LOGIR imaging infrared precision rocket and DS-16 smart munition. Avibras Skyfire-70 and Equipaer 70-mm rocket pods are also on show. A second B-250 is taking part in the daily air display. Alongside the B-250 is the T-Xc Sovi basic trainer aircraft, which is also a Novaer design, first flying in Brazil in 2015. The side-by-side aircraft has a pressurized cabin that permits a service ceiling of 25,000 feet, and it can be powered by either piston or turboprop powerplants. Novaer designed the aircraft with an aim of providing a successor to the Brazilian air force’s aging T-25 Universal and T-27 Tucano fleets.